Grab your binoculars and put on your safari hat - your journey through Africa has begun! Regenstein African Journey (RAJ) is one of the most popular buildings at Lincoln Park Zoo. There are so many unusual animals – from stately giraffes to the powerful aardvark – and the building’s setup takes you through various African habitats, as if you really are travelling! How many crocodiles do you see? The African Dwarf Crocodiles you see basking and floating are all siblings. They are masters of camouflage and can be difficult to spot. How many can you find? What’s beyond those double doors? These doors head to the main entrance, but don’t forget to stroll through. You’ll find birds and monkeys hopping from limb to limb. 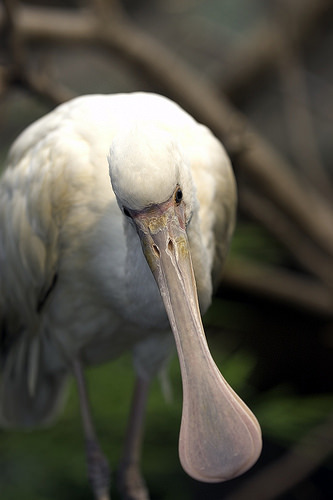 Take a moment to notice the different beaks of the Hadada Ibis, Abdim’s Stork, and African Spoonbill. If you look towards the back, you’ll see a family of Diana Monkeys grooming one another! A baby Diana was born August 3rd, 2018 so be on the lookout for a soon-to-be 1-year-old! Reverse back to our LEAP entrance. It’s time to head to the left! Look for Golden Orb Weaver Spiders! You’ll only see females on exhibit – the males are too tiny to see! Why is the floor squishy? As you pass the termite mound, you’ll notice the floor changing. You’re entering the riverbank! Stop for a moment and see if you can spot the Pygmy Hippopotamus. Hippos shouldn’t be hard to find, right? Annie and Howie like to sleep and are very still, so they are often mistaken for large rocks in the water. You said there were giraffes… where are they? You’re almost there! Continue around the bend and you’ll find a new area. Here you’ll find the Aardvark, Meerkats, and (drum roll, please!) Giraffes! Paatsy, the aardvark, and the meerkat mob often switch exhibits. This is great enrichment for them! Etana,the giraffe, was joined by a new friend, Finely, last May. Can you tell who is who?.